STEEM retesting lows again - Will it hold? My PC got short-circuited during a power trip yesterday, frying out my favourite x79 motherboard (sigh) hence I was not able to post an update yesterday. I am still mourning over my loss and am using this old pc to post in the interim until I can figure something out. Please bear with me. 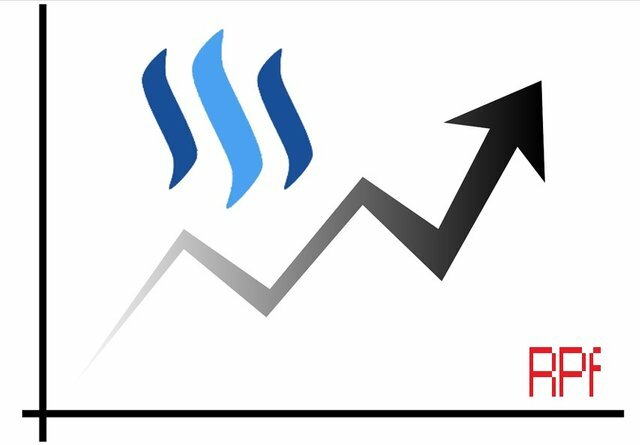 "Even though there are signs of an emerging bullish divergence indicating a potential for reversal to higher prices, the underlying demand for steem has not exhibited sufficient strength and conviction to carry this through for now. As such, expect prices to consolidate here further, testing the current 0.00105 support, and if broken convincingly, to revisit the next support levels at the 0.0010 area." Well, the price consolidated predominantly above the 0.001045 mark for a good number of 2-hr candle periods before it broke through this strong support, then headed downwards quickly, breaking through the next 0.0010 support level with little effort - definitely much easier than what I had anticipated. It is now testing to break the double bottom at 0.00094. 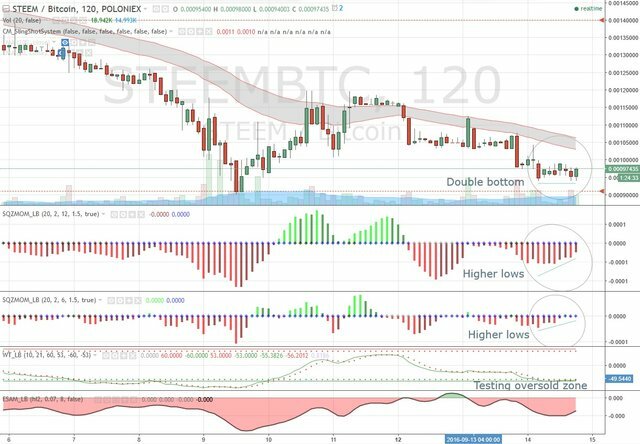 Direction and probability: The current double bottom vs both the higher lows from the directional indicators reflect an emerging bullish divergence, assuming STEEM/BTC performs a pullback upwards to complete this formation. This comes on the back of strength indicators starting to show signs of STEEM near oversold levels. However with momentum still in the red zone, we would likely see STEEM venturing further into oversold territory before a rebound happens. 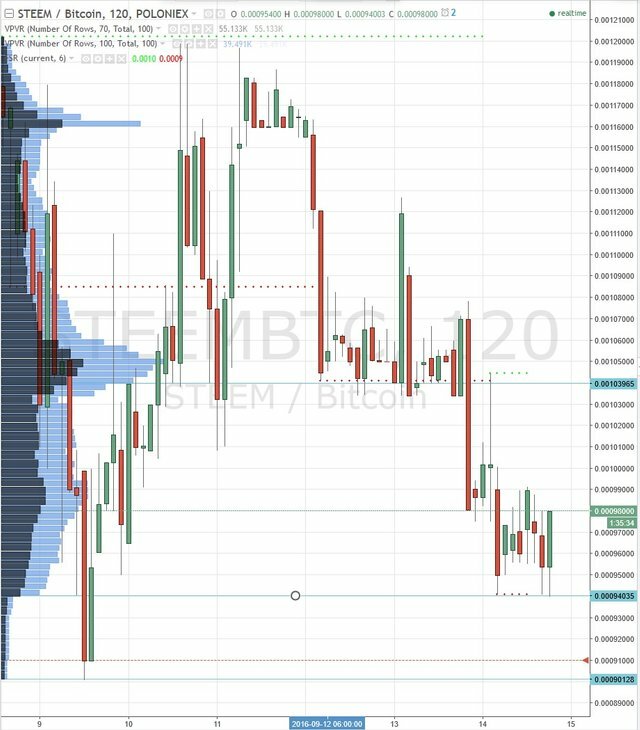 Support and Resistance: In the event this breaks downwards, I expect STEEM/BTC to head very quickly to the next major double bottom at 0.0009 to next test that stronghold. Conversely, any rebound should see STEEM heading back up to test the 0.00104 again - that area happens to also reside within the cloud resistance area. Bottomline: Opportunities are definitely there for Steem price to reverse upwards, although there is a higher likelihood that it will still need to retest lower first before bargain hunting kicks back in and get the rebound going. I would be taking the patient approach to join these anglers for now. In terms of disclaimers: these are just my own views and I will not be responsible for any trades that you may end up taking based on them. You are ultimately responsible for all your trading actions. In terms of disclosures: I currently have a long STEEM/BTC position which i may add to it at the next swing low test if it eventuates, assuming divergence and strength indicators align to infer a strong rebound price action then.